Now Saxons are nothing that fits my immediate Napoleonic plans. 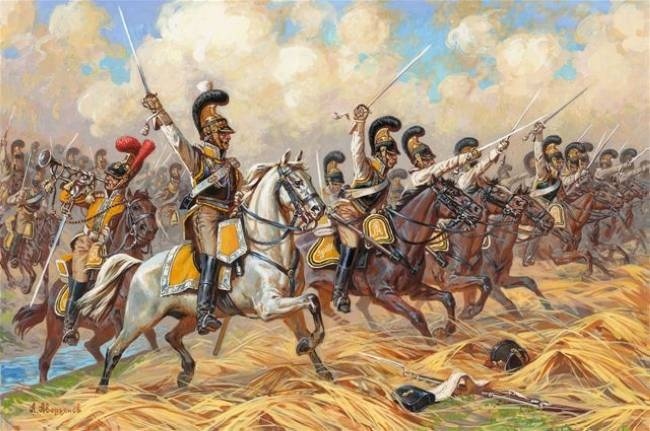 As you know my Völkerschlacht game for next year only involves Prussians and French and I stated too late with Napoleonics to get enough minis done for the 200th anniversary of the Russian campaign. But when I saw the first previews of Eurekas Saxon Cuirassiers I, immediately fell in love with them. I really liked the poses of the charging troopers. So in spite the fact that I do not need them right now, I decided to order enough to do both the Garde du Corps and Zastrow Kürassiere for Borodino. The fact that Eureka will be at Salute and I have a friend who can pick them up for me (thus evading custom fees) was an added bonus :-D.